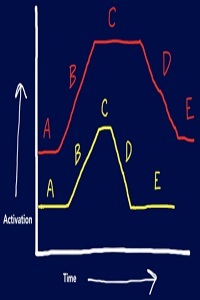 Some concerns of the A-B-A-B design include the effects of maturation, timing of training, amount of training, and other threats to internal validity. For instance, through the A-B-A-B design, we have no way of knowing if a little more biscuit training would have increased the response even greater than that of the praise. We also don’t know if other variables aside from those measured actually caused the change in behavior unless we spend a great amount of time and effort controlling for these possible confounds. A way to minimize these weaknesses is through the technique known as multiple baselines. Multiple baselines approach uses a varying time schedule that allows the researcher to determine if the application of treatment is truly influencing the change in behavior. For example, we might vary the length of time in the initial baseline determination and then apply the treatment to determine if the change in behavior corresponds with the introduction of treatment. We might apply varying amounts of a specific treatment (verbal praise verses verbal and physical praise) to better understand not only the best treatment but also the best amount of treatment. Figure 4.4 uses the multiple baseline design to determine if the timing of treatment is important. Notice how the behavioral change took place for each subject immediately following the introduction of treatment. This graph shows that the timing of treatment is not important but also shows that change is directly related to the treatment. Figure 4.5 tells us a different story. Had we only tested subject A, we might have assumed that the treatment effected the change. Subjects B and C however, demonstrate that the treatment actually had no effect on the behavioral change. In fact, the behavior changed at the same time for each subject regardless of when the treatment was applied. Without the time-lagged approach of multiple baseline design, this phenomenon would have been missed.